Is there anything prettier than a pile of freshly baked scones? Although I love scones of all types, I usually bake sweet scones, and I think most Americans picture sweet scones when you talk of scones at all. However, to my surprise, Hubby’s workplace specifically requested a bacon-filled breakfast scone. After my initial surprise, I set to work developing a recipe that would do justice to bacon and a savory scone breakfast. This is what I came up with. 1. 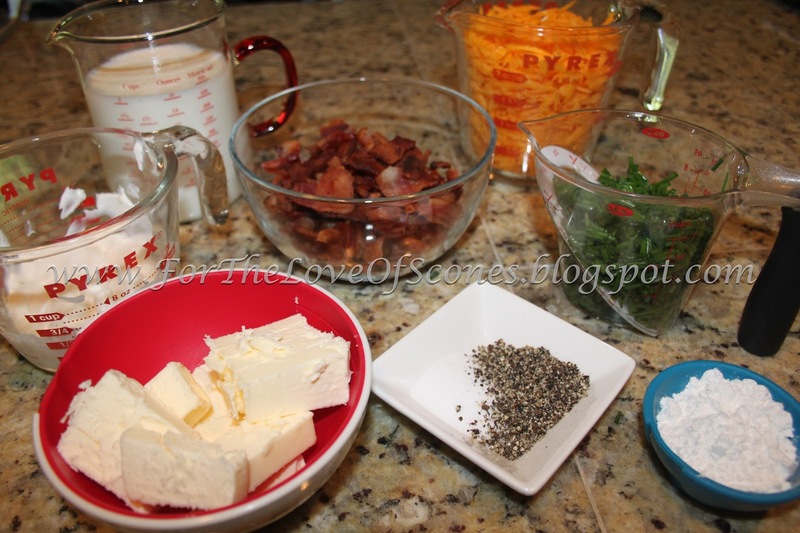 Cook bacon on stovetop, drain and cool on a paper towel lined plate or tray. 2. Preheat the oven to 425ºF. 3. Combine flour, salt, pepper, and baking powder in a large bowl. Whisk to mix. 4. Set aside the flour mix and chop the cooled bacon into inch-long pieces. 5. Cut butter into 1/2-inch pieces and combine with dry ingredients using a pastry cutter. 6. 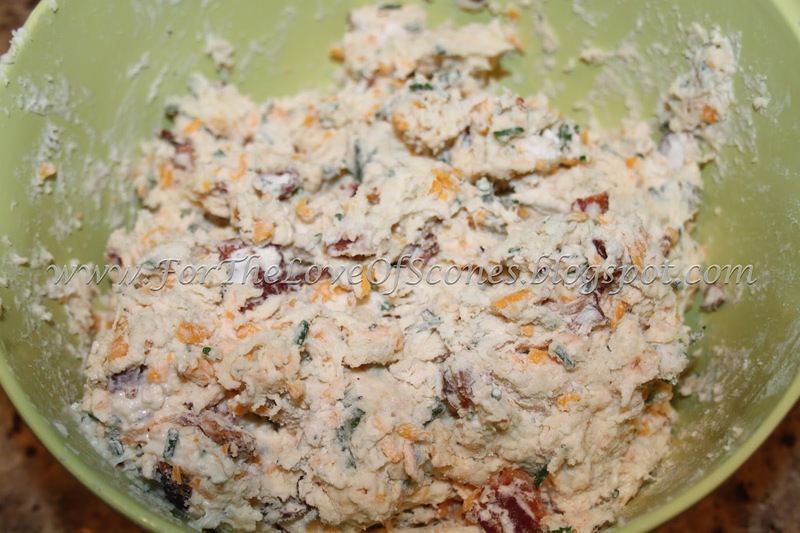 Add cheddar, chopped bacon, and chives and use a wooden spoon to mix well. 7. Combine sour cream and buttermilk and whisk until no chunks remain. 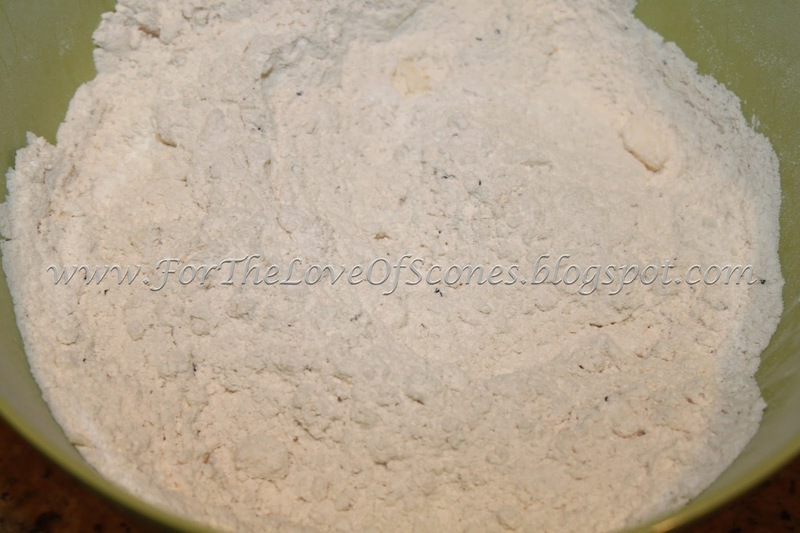 Add to flour until you get a dry dough (do not overmix). 8. Use a 1/3-cup scoop to form drop scones. Spray or coat the scoop with oil to release scones easier. Place each scone on a parchment-lined sheet, about two inches apart. Makes 20-21 scones. 9. Optional: mix egg with 2 tbsp of water and brush on the top of the scones before baking. 10. Bake at 425ºF for 15-17 minutes or until golden. Measure out everything before you get started. Combine the flour, baking powder, salt, and pepper. Then add the cubed butter and work in until it resembles coarse sand. 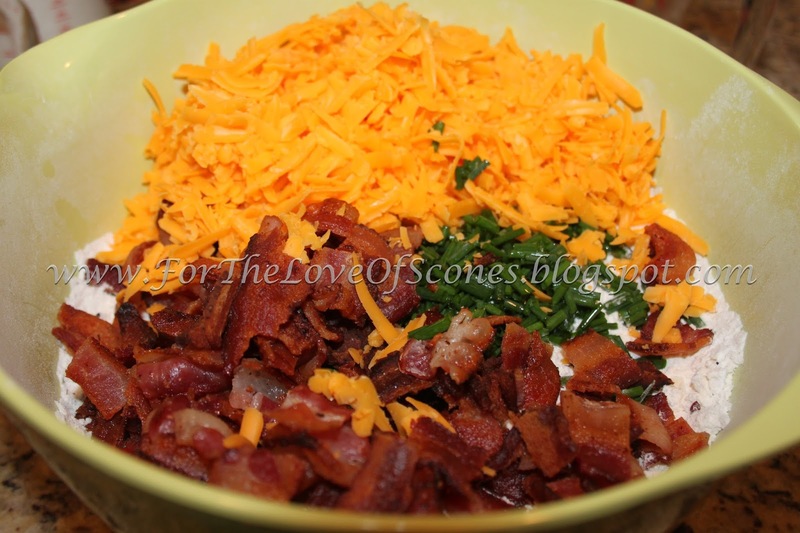 Add the chives, bacon and cheese. 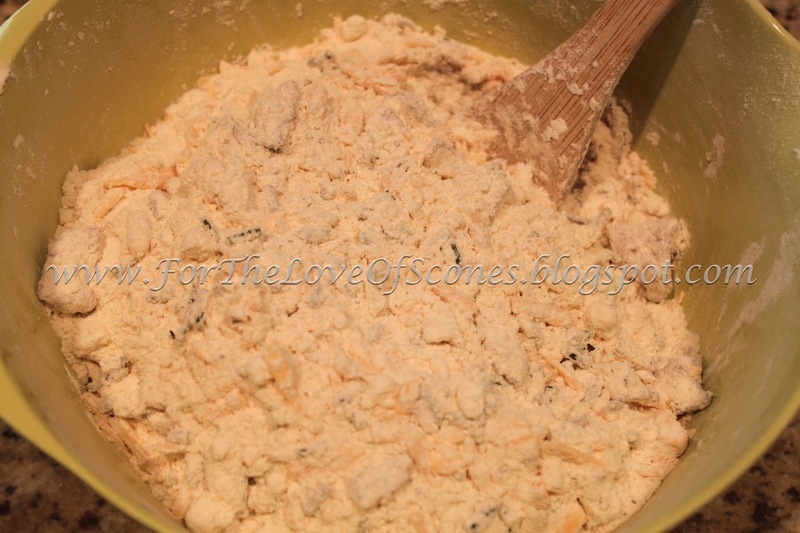 Add the buttermilk, sour cream mixture and stir to combine. Try not to overwork but combine as much as possible. place about 2 inches apart on a parchment lined baking sheet. Bake until golden, about 15-17 minutes. *I used Kroger sharp cheddar, if using an expensive sharp or extra-sharp cheddar, you could cut down to 2 cups. 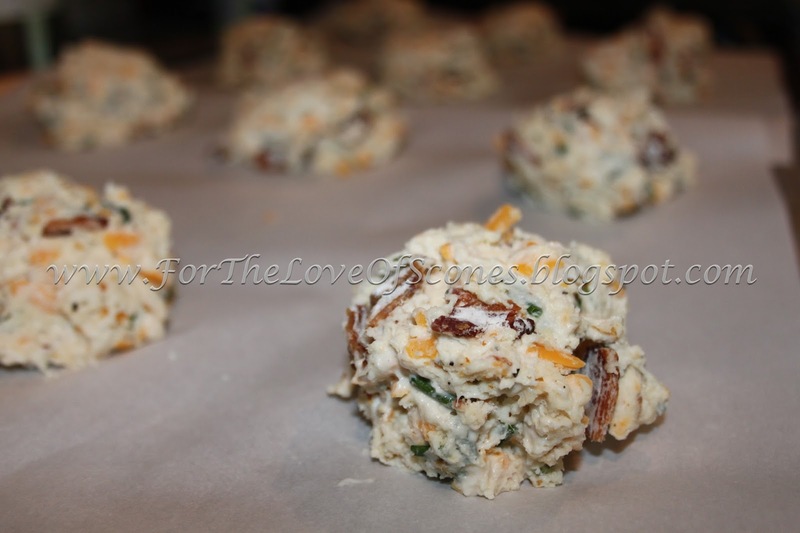 I think next time I make these, I would add some jalapeños or cayenne pepper for a bit of spice. The comments received on these scones were overwhelmingly positive. I snitched the barest piece, but I think an extra-sharp cheddar or more high quality cheddar cheese would be worth the investment. 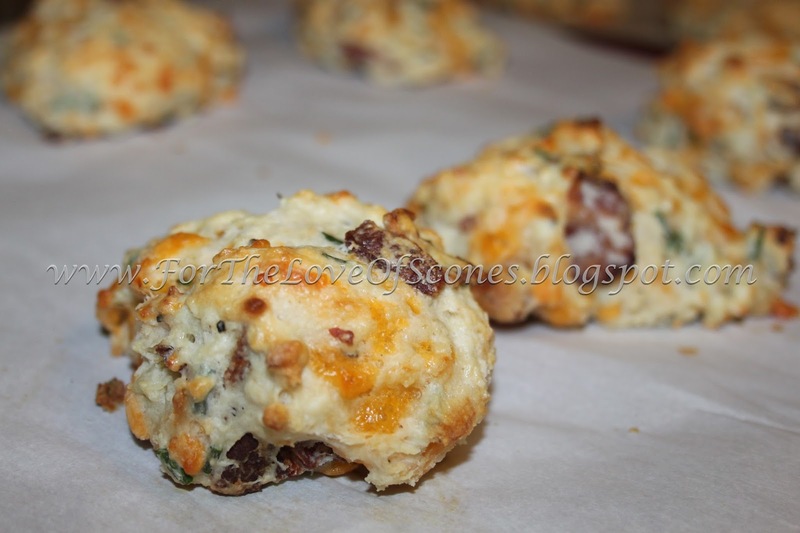 These would be great to keep in the freezer and bake a couple at a time for a quick breakfast scone or to serve to guests as a quick and easy breakfast. They also would complement chili or some other hearty soup well, I think. They’d probably taste well with Tabasco or a dollop of sour cream on top. 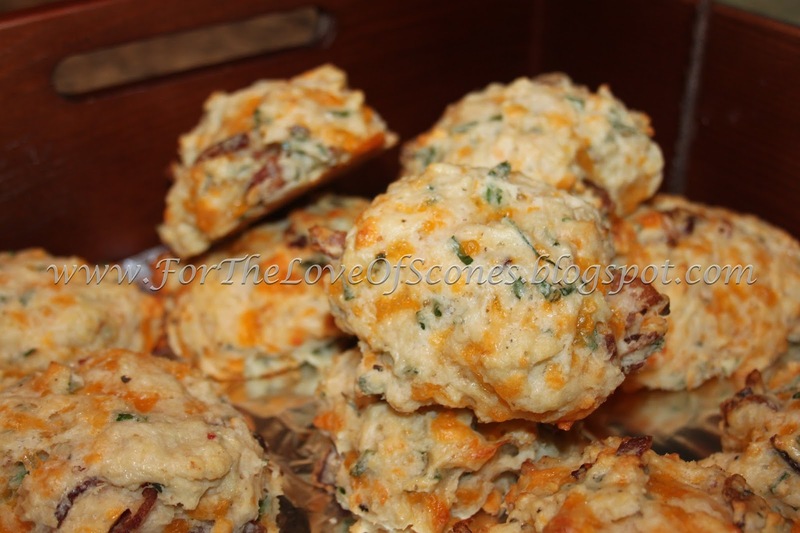 All in all, these are a pretty versatile scone full of different ways to enjoy it.